When it’s about choosing a business name we all get cautious that it should be unique, short, memorable, meaningful and must be related to the business. Something which leaves a footprint in the mind of our customers and clients that relate everything that we deal with. Well, you are not alone in this dilemma, in fact, most of us face the exact same problem while selecting a business name. And the main reason is that there are too many things we are trying to connect with our business name. Probably that won’t be possible that your name meets all your expectations but it’s worth if you get closer to it. And this article is all about filling that gap what you think and what best you can get. So in order to lessen your burden, we have prepared a list of websites that can help you to decide a business name without paying a single penny. Not the only business name but you can find the same domain name. I have seen many companies whose name is not matching with their domain name. Technically there is no major difference of carrying a domain other than your business name. But if you have it is an advantage for you as it is easy for your clients and customers to remember. Apart from this Google search engine also give you preference on organic search when your business name is same as a domain but this is minor not a major impact. Shopify is a famous e-commerce website which provides both domestic and international platforms for retail and wholesaling. 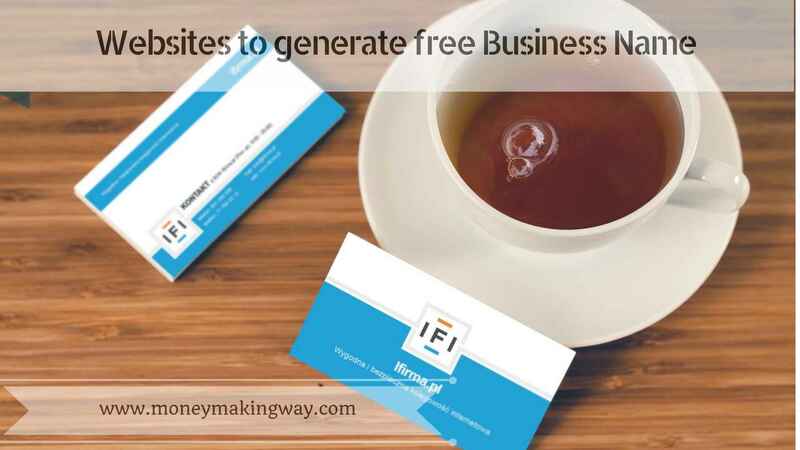 But they also provide a free tool to generate the business name. All you need to do is to put the keyword or idea of your business name in their search column and you will get hundreds of options to select. Not only Business name but they will also let you know the availability of your domain. Cool names filter the process by adding some additional steps while feeding the information. In the first column, you need to give little details about your business. Then you have to provide details like the type of business and what benefits it could bring to the customers. The next you need to tell what style of business are you naming like, peace, bang, cool and simple. And the last step is to select the extension whether you want .com, .org, .net,US or any other desired extension. Another great website to search business name just key in the word related to your desired business name. And it will throughout the entire list of the suggestions. Basically, you will find two columns one is with your business name other with the available extensions. Navigation is so smooth that it takes almost few minutes to complete all the tasks. It works similar with any other website where you just need to put the desired word and it will suggest you hundreds of related names. But this does not provide you the domain availability at the same time. However, when you choose any of the displayed business names it will take you to the Godaddy website in order to check the domain availability. Which is an additional step but still a good website if you are looking a unique name for your business. Searching a business name with Naming is quite different and unique as compared to other websites. here you need to put a word in the first column. In the second column, you need to select “combined your entry with” like adding greek prefixes or suffixes. The next is to add syllables and where you want your selected word to appear right side or left side. Now you need to select the extension of domain and number of names you want with a single search. you can see up to 816 names in one go. On this website, you won’t find any search tab and multiple filtrations to get the results. All you need to do is to click on the button “Get Name” and it will through you some random names from their database. they have more than 7.2 million unique business names. The name is self-explanatory how this website provides a unique business name. What all you need to do is to provide a keyword and then you need to choose from their defined category like Rhyme from the beginning, middle or at the end. On the basis of the Rhyme, the site will pull out lots of results and you can choose one the best you want. I think this one has a unique way of searching a business name. Choose a word in the left box and with some ending in the right box. And if you find any name that you want to take then save to scratchboard. With a click of a mouse, you will get hundreds of suggestions related to your keyword. Here you can provide more than one keyword with spaces and then you just need click generate brand names. And the site will show you plenty of business name matching with your supplied keywords. And once you select any name it will take you to the page to buy your domain name. No matter what kind of business are you doing but the brand value start right from your name. And that’s why it is an important aspect of our business. Choosing a business name could be a difficult task as it connected with the overall business. A perfect name should be memorable, meaningful, catchy and should also be related to company’s vision. If it has all the qualities it can make a huge impact on your business. Now finding a versatile business name could be the toughest job. But now the best results are just away from a click of a button. Try these websites and find a perfect business name.